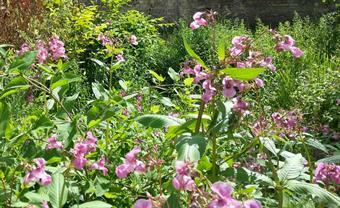 Himalayan Balsam (Impatiens gladulifera) spreads easily along streams and displaces native vegetation; there is also Japanese Knotweed (Fallopia japonica) behind at the left (click image to enlarge, ← to return). Invasive Alien Species are animals and plants that are introduced accidentally or deliberately into a natural environment where they are not normally found, with serious negative consequences for their new environment. Some are introduced accidentally, for example in imported produce such as timber or water pumped from ships. However, very many are introduced as plants or animals that are attractive. Humans have been moving species around deliberately for millennia, accidentally (e.g. rats) or as food plants and animals. In many cases such crop or garden species need careful cultivation and do not thrive in new environments. However, some spread vigorously with serious cost as pests for humans or displacing native species. In Europe, the annual cost of managing invasive non-native species exceeds €12 billion. The European Commission has passed a Directive to prevent introduction of known invasive species, and to help detect, manage and eradicate those already present. Help from local people is essential for detecting such species and, where possible, removing them quickly before they become established. If that is not done, these species spread and the problems from them become much worse: the next year they have covered all the ground and water, or a much loved native species has vanished. BEST PRACTISE contains links to more information on the problem, and on the species most problematic in Europe so that they can be recognised, reported, and help sought to remove them. MAPPING and removal work could benefit greatly from coordination by local communities and clubs . Please REGISTER, and if possible DONATE to help us build up guidance for communities and managers on removing invasive alien species across Europe.